Can MBA degree change your perspective on work and also life? 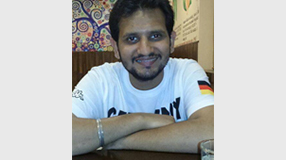 After bagging a prestigious placement, Nikhil Kashive shows that it can. Nikhil Kashive in 2014: MBA doesn’t teach you anything that life can’t. Nikhil Kashive in 2018: If you want to make headway in your corporate career, you need to do MBA. MBA teaches you a lot. Few years ago, the young engineering graduate was on a high working with renowned brands like HCL and Mphasis. However he admits that, in spite of making good money, he felt stagnated in his career. He came to FORE School of Management, New Delhi to elevate his career graph. The journey was filled with learning that helped him grow as an individual and a professional. He shares a life lesson learnt at the B-School: “My internship with Triveni Ethnics taught me that Sales isn’t about convincing the buyer, but being convinced about the product yourself.” Bagging a placement with Accenture Technologies, he heaved a sigh of relief. His gamble of quitting a well-paid job had paid off. Here’s how it all worked out for him. What was your first reaction when you bagged the placement? Honestly it was a huge relief for me to know that the two-year gap without a regular income was worth the effort. I am an engineer with almost 4 years of work experience. But, while working, I realized that no matter how much money I made I wouldn’t be growing as a person and in my career. I am glad to have joined FORE School of Management. Can you talk us through the placement process and the steps it involved? The placement process for Accenture began with group discussion, followed by three rounds of interviews involving technical aspects, skills, and HR. All rounds were based strictly on my resume. And that was one thing I was very particular about. I didn’t try to be someone else during the interviews; I didn’t put anything on my resume that I couldn’t justify. How was your journey with the B-School? What will you miss the most? The journey has been absolutely brilliant! FORE School of Management has opened my eyes to many new things and changed my opinion about others. I don’t think I will miss anything, because my association with my college won’t end after convocation. I will stay connected with my alma mater in every way I can. Yes, I will miss my friends though. They say SIPs are the most crucial building blocks for management professionals. How was your experience? I came to FORE School of Management with eyes set on a Sales role. My internship with Triveni Ethnics involving Sales really changed my perspective about how I looked at work. I knew Sales was all about convincing yourself before the buyer. After the pre-placement presentation with Accenture, I think, I was convinced the job was for me. So it wasn’t hard selling my candidature to interviewers. How did you impress your interviewers? Any insights or tips you can offer? I justified all the decisions I took in my life, professionally and personally. I accepted all the mistakes I had made in the past, because the idea wasn’t to start on a clean slate with no errors but to learn from those mistakes. You should always stay sharp because the domain is volatile and technology is evolving rapidly. Keep learning and keep gaining experience, both professionally and personally. Travel with the job if you have to, because it will teach you a lot. What are your goals and strategies for your new job? I will be working in an advisory role as a domain expert on upcoming technologies. The first few years will mostly revolve around Business Development. My strategy is to keep learning and proving myself every day at work. That way I would stay consequential to my organization, even if my work with the current team ceased to exist.